After a couple of long days, things were settling down for J, me, and the new addition to our family, L. Like we were expecting, sleep was rare the first couple nights and eating for me since we got to the hospital on Thursday was something I sort of put on the back burner. On Monday night, the hunger pangs were setting in and after I got J settled with her meal and Baby L was content, I asked if it was ok if I took off for a little bit to get something to eat for myself. We’re not out in the Gull Road area very often, so I really didn’t know what my options were. I had thought about fried chicken but I didn’t want to bring that back to the hospital room. 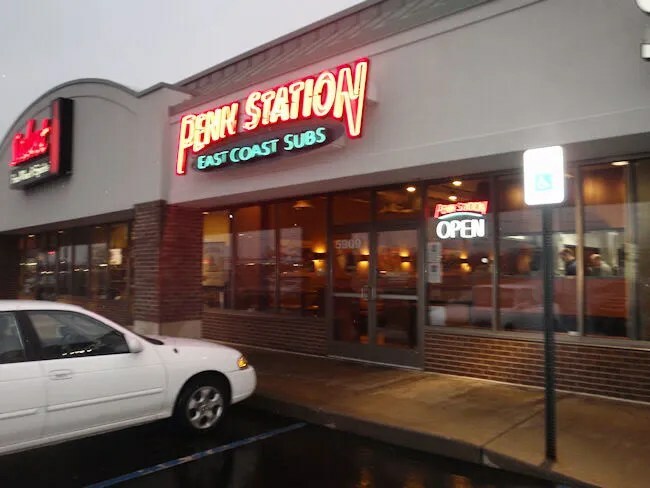 I remembered there was a Penn Station somewhere on Gull Road so I went looking for that knowing that it’s always a quality meal. After getting a few honks for driving too slow while I was looking in all the strip malls along Gull Road, I finally found the Penn Station on Gull Road just to the southwest of 26th Street and across the street from Applebees. The Gull Road is a little bit smaller than the Portage and West Main locations, but it’s set up exactly the same. The order area is right inside the door to the right. There were only two people working the kitchen when I walked in and one of them said he’d be right there. More than anything, I really wanted an order of fries and so did J. She was actually eating a really good pasta meal at the hospital, but when I said I was going to Penn Station, she asked for an order of fries as well. I got myself a large since I hadn’t really eaten in four days and I got her a small. I figured if she wanted more, she could have a few of mine. For the sandwich, I ordered a 10″ pizza and opted for the Italian sausage for a little extra. When I got down to the cashier station, I added on a Pepsi for a total just over $16. I had to make a couple more stops on my way back to the hospital. I wanted to grab some bottles of Sprite from Walgreens so I had to wait a few more minutes before I could dig into the goodness contained in the brown paper bag on the passenger seat. As I got back on Gull Road, I reached into the bag and started in on fries. 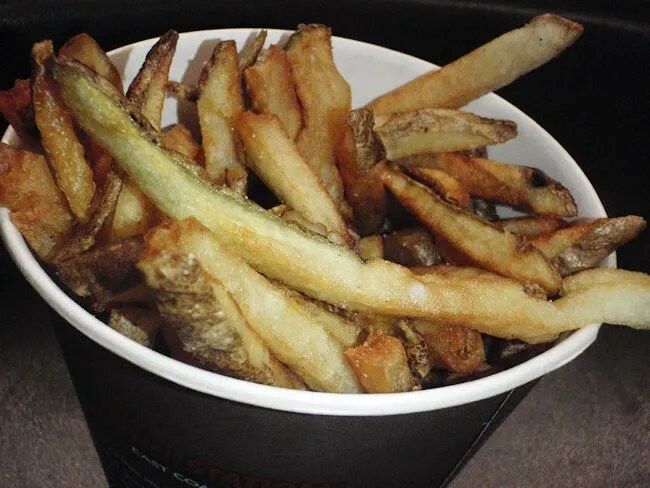 I absolutely love Penn Station’s fries. They’re fresh cut, they’re flash fried in Peanut Oil, and most of all, they’re golden brown delicious. The large size is really large. Really, really large. They’re actually almost a meal all on their own and even after I got back to J’s room I kept eating them before I even thought about unwrapping my sandwich. After getting every last fry out of the paper cup, I finally got around to my sandwich. The sandwich was cut in half and even half was almost too much for me after the fries. 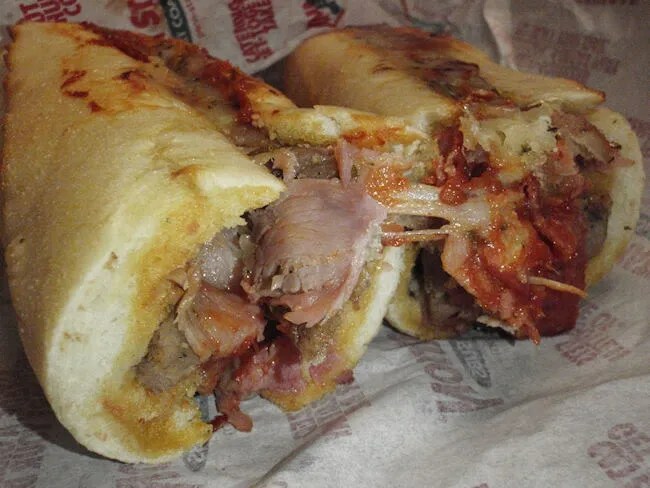 The hoagie type bread was filled with pepperoni, smoked ham, Sweet Italian sauage provolone and Parmesan cheeses and pizza sauce. My experience in the past has been that the subs were a little light on the fillings, but this sandwich was overflowing with meat. The sausage, although a little extra, is worth it on this sandwich. It’s a sweet sausage that is a great compliment to the spicy pepperoni. I only ate half the sandwich for dinner then wrapped up the other half for later. It made a great late night snack when we got up to feed a hungry baby. Another great meal from Penn Station. I’m really happy someone decided to bring this chain to town. Yes, I’m happy to eat at a chain. I’m a bad food blogger, but that’s ok. Sometimes, quick and delicious is just what I need. Congratulations to you and your family. I recently moved to Kzoo and found your blog. We tried HopCat based on it — good choice! Congratulations to you and J.